Spiders as we know them today have been around for approximately 300 million years. They exist on every continent, occupying a variety of habitats, from marine environments to the desert. The spider is a finely adapted animal who has ostensibly perfected the art of survival. Using a number of methods to keep the species going, spiders live in perfect harmony with nature and will continue to thrive. When a spider mite is born, it is tiny and practically defenseless. Spider mites make easy pickings for predators. Rather than investing time and energy into protecting individual mites, for example by evolving to develop a system of offspring protection the way mammals do, spiders have evolved another adaptation. A female spider can lay hundreds, sometimes thousands of eggs in just a few minutes. Approximately 2 percent of those eggs will produce mites that survive to adulthood. Because of their capability for rapid and large scale reproduction, spiders have mitigated the challenges faced by their species. Even the most notoriously dangerous spiders have their predators. The black widow (Latrodectus mactans) is highly venomous, but she’s still regarded as food by a number of animals, including wasps, parasites and even ants. However, spiders keep the species going because they are not easy pickings. Spiders have developed a number of self-defense mechanisms, from the tarantula’s (theraphosidae) ability to fire its fur at a perceived predator to the golden orb weaver’s (Nephila antipodiana) use of dangerous chemical deterrents. Spiders do not rely on a single means of self-defense. Each spider family has evolved its own way of handling predators. Whether it’s for reproducing or self protecting, the spider is highly adapted and will do almost anything to ensure the progress of the species. For example, most spiders, including the notorious Sydney funnel web (Atrax robustus) can shed their limbs if needed to escape attack. Sexual cannibalism is another quirk of evolution that has kept the spider going. Many species, including the black widow, have evolved so the female is larger, stronger and more dominant than the male, whom she kills and eats after copulation. This process nourishes the female, leaving her well prepared to carry the young. The male's apparent complicity in this suggests a deep parental investment in the survival of the young. The most important spider adaptation is the ability to spin silk and weave webs. Fossil evidence suggests that spiders once had no ability to create silk, but developed it very slowly over millions of years, to a point at which they are expert silk weavers. 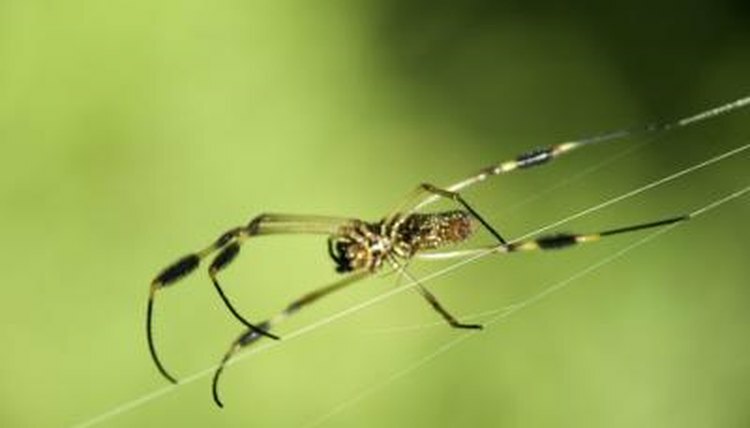 Spinning a web to catch prey is one of the most effective hunting mechanisms in the natural world. Using a web to hunt is less tiring and presents less hazardous than hunting live prey. It also means spiders can catch prey while sleeping, making the web an extremely efficient hunting mechanism. Not all spiders do this however, the trapdoor spider (Ctenizoidea) has its own trick. It digs a burrow with a door-like mechanism at the top from where it can launch surprise attacks on its prey.